The worlds best speech recognition software for immediate desktop transcription! Dragon NaturallySpeaking Professional is the ideal solution for busy professionals to create documents and e-mails, fill out forms, and streamline workflow tasks – all by speaking. Turn your voice into text three times faster than most people type with up to 99% accuracy using virtually any Windows-based application. New Dragon Voice Shortcuts collapse common tasks into simple voice commands. Or create custom commands to automate repetitive tasks you perform that involve multiple keystrokes or mouse clicks. You can even dictate into a handheld device when you’re away from your PC, or use a Bluetooth wireless microphone. This edition offers complete enterprise network support, including new security features, a special management guide for IT professionals and support for Citrix deployments. The best is now even better. Use Dragon Voice Shortcuts to quickly search for information on the Web or on your own computer. Need to find some information on the Web? Just say “search the Web for global warming articles”, “search Wikipedia for George Washington Carver” or “search eBay for Batman comic books”. You can even say “find an email about the Robinson report” to quickly locate information on your computer. Search the Web or your computer was never faster – or easier. You’re reviewing a document and realize you need to send an important email to your colleagues, just say “send an email to Steve Chambers and Raphael Sanchez” and Dragon will launch your email program, create a new email and put the names you said into the “To:” box. Need to schedule a meeting instead? Just say “schedule a meeting with Steve Chambers and Raphael Sanchez” and Dragon will do the rest. Includes user profile management and security features for enterprise deployments, as well as roaming user support, and support for Citrix environments. Use Dragon NaturallySpeaking with Nuance-approved Bluetooth wireless headsets. Convenient to use with a Tablet PC system! So effortless, you hardly have to think about it. Automatic tuning programs can be run to improve accuracy overnight. Improved Help System and Tutorials are easier to see and more intuitive to navigate. But that's just the tip of the iceberg. With Dragon NaturallySpeaking 10, you can dictate using any Nuance-approved Bluetooth wireless microphone. Plus, we've optimized Natural Language Commands and proofing with dictation playback, along with the ability to dictate into your Pocket PC, Palm Tungsten' or digital handheld recorder for transcription later. And it's compatible with the latest Microsoft Office and Internet Explorer, as well as Mozilla Firefox and Corel WordPerfect. 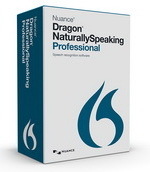 *Dragon NaturallySpeaking Medical is now officially "Dragon Medical" from the Dictaphone division of Nuance Communications, Inc.
"I've been a Dragon convert for years, so I'm really impressed at how they found ways to make an incredible productivity tool even better." "This new version turns speech into screen text so fast it's like it's reading my mind!" "Web and desktop searches are virtually instantaneous using Dragon Voice Shortcuts."